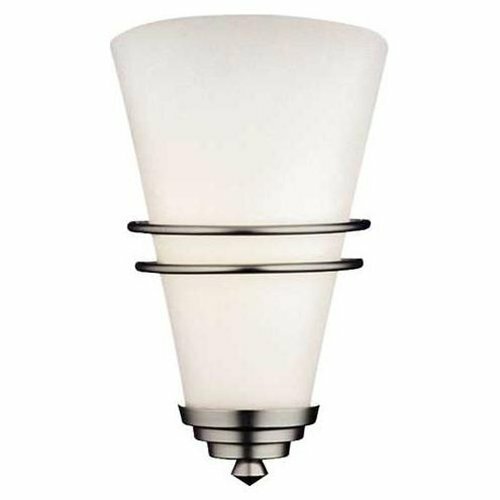 Niles One Light Wall Sconce i..
FCL3101: Features: -This item is an energy efficient product.-One light wall sconce.-White opal glass shade.-ADA compliant.-CULus listed.-Suitable for dry location. Color/Finish: -Merlot bronze finish. Specifications: -120 Volts.-Accommodates (1) 75W medium base bulb or (1) 18W compact fluorescent quad 4 pin bulb (not included). Dimensions: -Overall dimensions: 13 H x 7.5 W x 4'' D. Collection: -Niles collection. This item is an energy efficient product. One light wall sconce. White opal glass shade. ADA compliant. CULus listed. Suitable for dry location. Color/Finish: Merlot bronze finish. Specifications: 120 Volts. Accommodates (1) 75W medium base bulb or (1) 18W compact fluorescent quad 4 pin bulb (not included). Dimensions: Overall dimensions: 13 H x 7.5 W x 4'' D. Collection: Niles collection.